Some sad news for fans of Sweet/Vicious. TVLine reports MTV has cancelled the TV series after only one season. 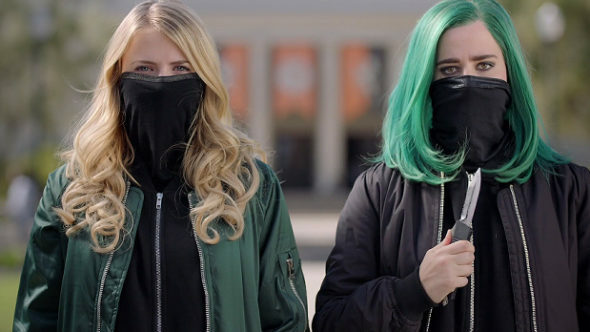 The dark comedy revolves around two female college students who secretly act as wannabe vigilantes. The cast includes Eliza Bennett, Taylor Dearden, Nick Fink, Dylan McTee, Brandon Mychal Smith, and Aisha Dee. The show’s cancellation is not a huge shock. Sweet/Vicious debuted last November to pretty poor ratings and the numbers only dropped further over the course of season one. Overall, the season averaged a .08 rating in the 18-49 demo and 180,000 viewers, making it MTV‘s lowest-rated and least-watched series for the 2016-2017 season. What do you think? Did you see Sweet/Vicious? Do you wish MTV gave it a second chance? Teen Wolf: Will Meagan Tandy Return for the Final Season? Damn it! This show was great. And it mattered. Are you serious?! Come on. Get rid of that teen mom crap and keep this MTV. Omg , no, why would the do this……. I love this show! !